This year, my students were having so much trouble grasping the concept of information reports. While it isn't the most exciting topic, I put together a pack which includes group work and step by step instructions on how to write information reports. - What is an information report? (activity & guide for class activities and discussion). - The structure of an information report. - Visual elements in an information report. - Glossary / bibiliography writing. - Sample information report from the National Geographic web. - Report writing tips poster. 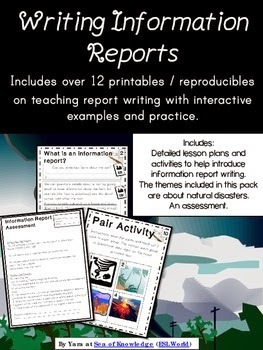 - Whole class / pair research activity with information provided. - Editing your draft of the report. - Checklist / pair checklist for editing. - Information report assessment with rubric.